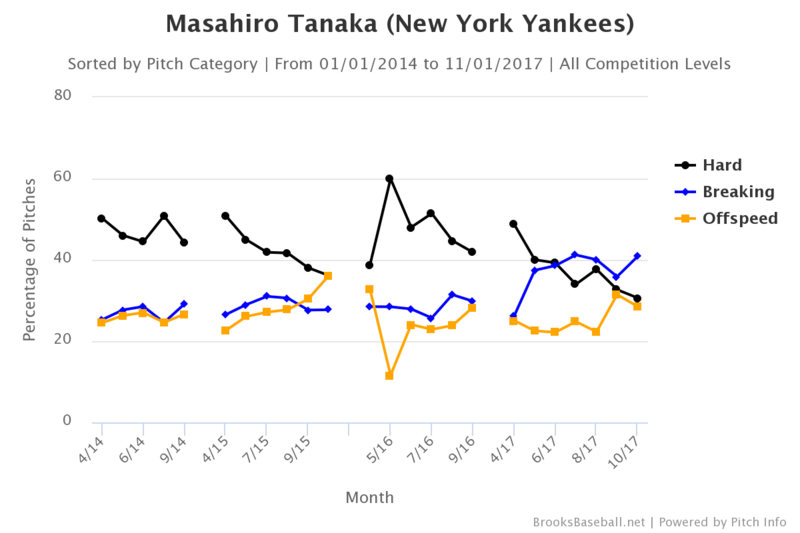 For the second straight season, Masahiro Tanaka has pitched pretty poorly out of the gate. He’s had some good starts here and there, but overall, a 4.95 ERA (4.82 FIP) in ten starts is a 4.95 ERA (4.82 FIP) in ten starts. There are 92 pitchers with enough innings to qualify for the ERA title at the moment and Tanaka ranks 81st in ERA and 77th in FIP. The numbers don’t lie. Tanaka’s slow start last season was much worse than this season. Through ten starts last year he had a 5.86 ERA (5.31 FIP) and we were talking about skipping starts and phantom disabled list stints and things like that. The Yankees never did any of that. They kept running Tanaka out there, and in his final 18 starts, he had a 3.69 ERA (3.54 FIP). Much better. Fewer fastballs, more bendy pitches, better results. We all know the story. Tanaka has continued with the anti-fastball philosophy this year — he’s thrown 27.2% fastballs this year, the lowest rate in MLB (Ross Stripling has the second lowest at 32.2%) — because hey, it worked last year, so keep doing it. See what I mean? Once Tanaka started throwing so many non-fastballs last year, his chase rate went through the roof. Now the chases are down. It was pretty obvious in his start three days ago, when he walked four batters in five innings against a Rangers team that generally doesn’t draw many walks. It’s not just the walks either. Tanaka was behind in the count a bunch and that created more problems. Tanaka posted a 39.7% chase rate from 2015-17, which was the best in baseball. Michael Pineda was a distant second at 37.3%. Like I said, Tanaka has been the best pitcher in baseball at generating swings on pitches out of the zone. That leads to swings and misses and it leads to soft contact. If a guy goes outside the zone and makes hard contact, you just tip your cap. More often than not, good things happen for the pitcher when a hitter chases. 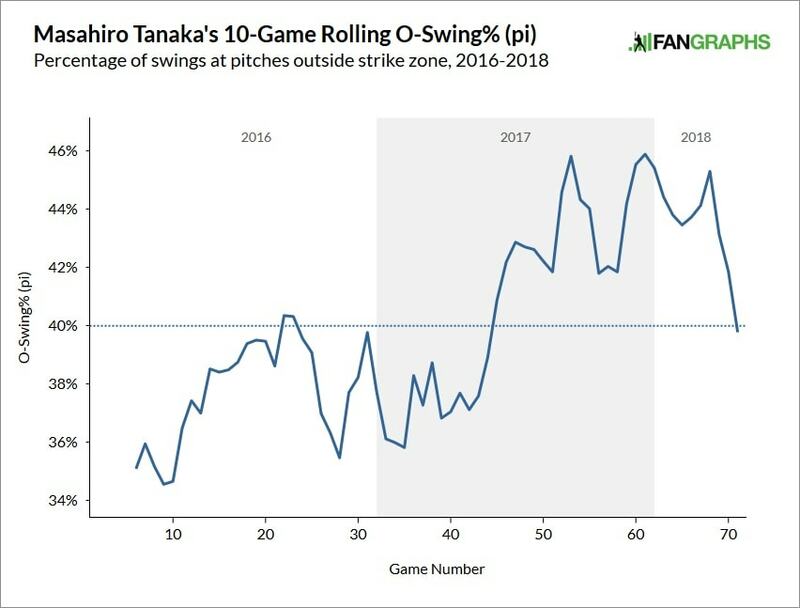 This season Tanaka has the second best chase rate (39.8%) in baseball behind Aaron Nola (40.0%), which is really good, but as the graph shows, Tanaka’s chase rate is trending down. That could be an indication hitters are beginning to adjust to the anti-fastball philosophy. Hitters aren’t stupid. Teams scout, teams do prep work. They know what’s up. Hitters know Tanaka doesn’t throw many fastballs nowadays and they’re beginning to adjust. 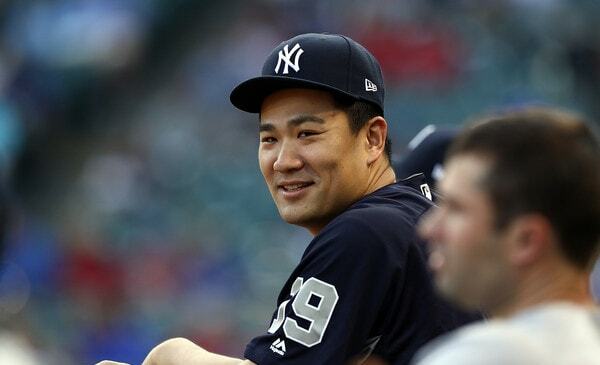 Because of that, it might be time for Tanaka to start working his fastball in a little more. I’m not saying he should throw heaters down the middle. But when hitters are thinking splitter down or slider away, you can get catch them looking at fastballs on the corners. We’ve all seen a hitter take a fastball in the zone for a strike and wonder what he was looking for. Well, he was looking for a non-fastball that would dip out of the zone. Last year Tanaka struggled early in the season, so he made an adjustment, and in this case that adjustment that was throwing fewer fastballs. Now hitters seem to be adjusting to that adjustment, which means it’s time for Tanaka to adjust to their adjustment to his adjustment. Got all that? It’s a vicious cycle. It’s baseball. A constant game of adjustments. Now that hitters seem to be doing a better job laying off the splitter and slider, more fastballs could be in the cards.